Fractures and instability sometimes necessitate surgical fixation of the lowest lumbar vertebra to the sacrum, otherwise known as L5-S1 fusion. Spinal fusions, including those at L5-S1, often are performed to treat chronic pain related to spinal degeneration or arthritis. Data published in January 2012 in the journal "Spine" indicate that the annual number of spinal fusions performed in the United States increased 2.4 times from 1998 to 2008. Potential complications from these surgeries can range from minor infections to occasional nerve damage or, rarely, death. The goal of L5-S1 fusion is to prevent movement of the spine from occurring at sites of instability or degeneration -- movement that could otherwise damage nerves or create unmanageable pain. Spinal fusion may be accomplished with a bone graft from a bone bank or the patient's own pelvis. Metal screws, plates or other hardware are sometimes used to stabilize the spine. Spine fusion shares some risks common to all major surgeries. These include excessive bleeding, reactions to drugs or anesthesia or formation of blood clots in vessels that might break free and damage organs, including the lungs. There is additional risk of injury to the spinal cord and surrounding spinal nerves. Damage in the area of L5-S1 may result in some degree of weakness or numbness in the legs. Of the more than 1 million people in the United States who underwent a lumbar spinal fusion between 1998 and 2008, approximately 1 in 500 died. This stark statistic includes patients who underwent surgery due to severe trauma or instability caused by cancer. 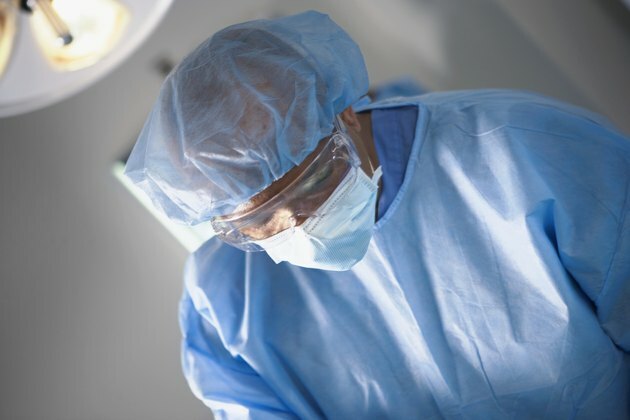 Surgeries always carry a risk for infection, which can vary by institution. Of 1,568 patients involved in a study published in October 2010 in the "European Spine Journal," the rate of deep surgical infection following spinal fusion was 2.2 percent. These patients required additional surgical interventions along with treatment with antibiotics. Some L5-S1 fusions also fail to accomplish the objective of reducing instability or pain, although rates vary depending on patient characteristics and surgical techniques. Improved techniques have increased success rates, but according to a review published in April 2009 in "Current Reviews in Musculoskeletal Medicine," fusions fail approximately 10 percent of the time, in some cases requiring repeat surgeries. Whether or not the fusion is technically successful, about 25 percent of patients fail to significantly symptomatically improve following lumbar spine fusion. In cases where bone is harvested from the patient to be used in the fusion, postsurgical pain at the donor site may also occur. Fusing one part of the spine shifts additional mechanical stress to the next mobile level above or below the fusion. Subsequent accelerated degeneration and instability at the level adjacent to a lumbar fusion is common. A review published in the "Bulletin of the NYU Hospital for Joint Diseases" in 2007 cites a 70 percent rate of adjacent degeneration evident on x-ray within 10 years of lumbar spine fusion. According to the review, in spite of the high rates of adjacent degeneration, only about 36 percent become symptomatic and fewer than half of these require further surgical intervention. Complications with L5-S1 fusions are more likely to occur in the presence of certain known risk factors. Older patients and those with additional health problems such as diabetes or cancer are at greater risk of complications, as are those with bleeding or clotting disorders. Specific to spine surgery, cigarette smoking significantly increases the odds that an attempted fusion will fail. In addition to increasing the odds of a non-union, smoking also increases the likelihood that the patient will be dissatisfied with the outcome of the surgery whether or not the fusion is technically successful. What are the Problems After a Spinal Fusion of C-5 & C-6?